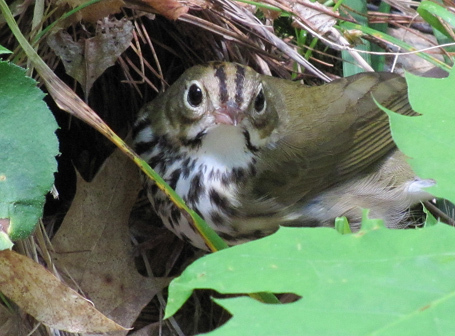 This male Louisiana Waterthrush has been singing away since May 7, 2012 but has yet to attract a female. Breeding was successful at this location in 2010 and 2011 but given that it’s nearly June already, the prospects are looking bleak for 2012. He sang constantly for the 1.5 hrs I was in the area – averaging one song every 7-10 seconds. 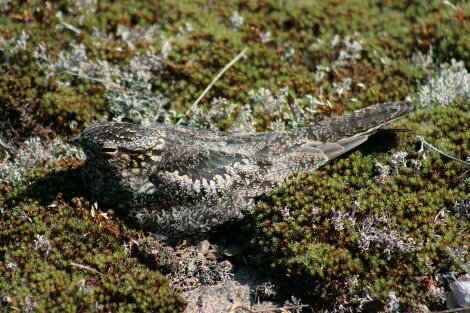 This is typical of males arriving on territory in late April and early May. Song frequency drops considerably after pair bond and nearly stops entirely during advanced nesting stages. 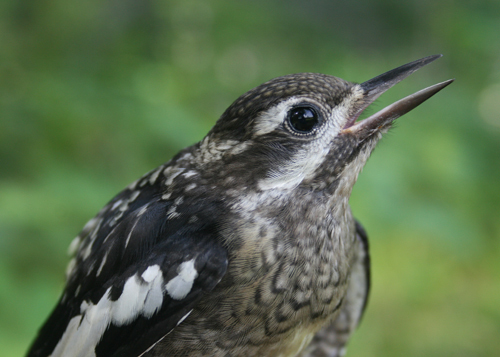 His spirited singing is indicative of an unmated male advertising for a mate. Hopefully his luck will change soon. 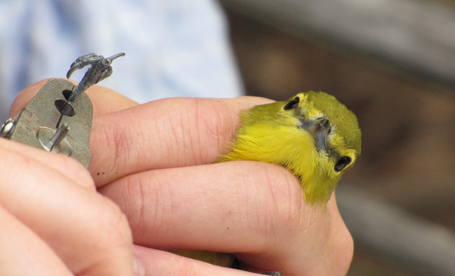 Fieldwork has kicked into full gear as the action-packed month of June is just a week away. 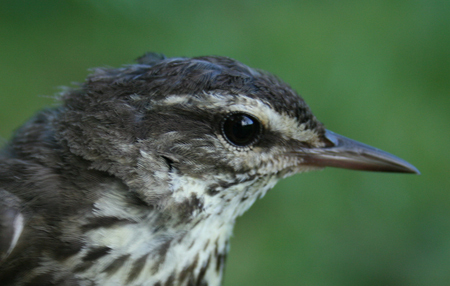 Our Louisiana Waterthrush surveys are nearing completion for the 2012 season. Soon I will be racking up the mileage while scouring the barrens for Prairie Warblers and other goodies in the southeast section of the park. It’s such a wonderful contrast to transition from damp mature forests to the hot and dry expanses of bedrock, poverty grass and junipers. 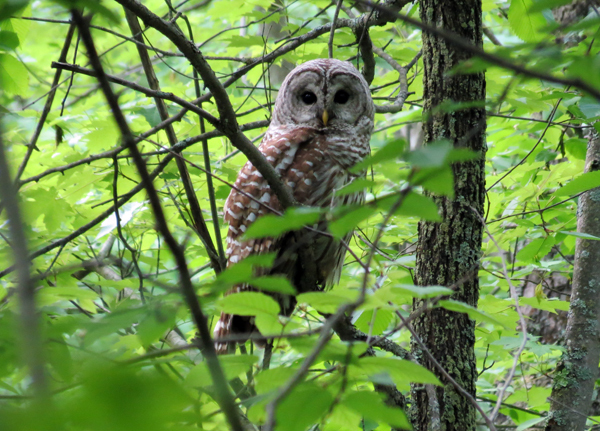 Yesterday I found this Barred Owl in a wooded swamp about 40m from where my truck was parked on Salmon Lake Road. Barred Owls are easily the most common owl species in the area. Great Horned Owls are comparatively rare in the hardwood forests but are found with some regularity in mature mixed coniferous zones. 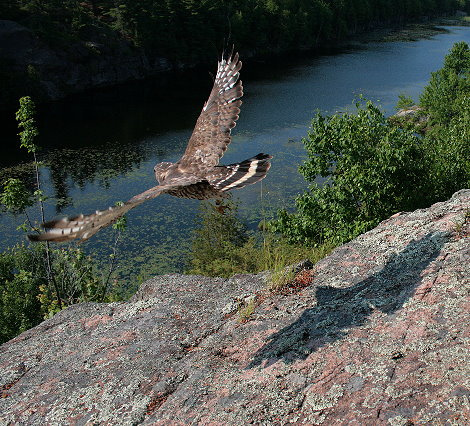 Owl populations would be an excellent subject FBS in the future. 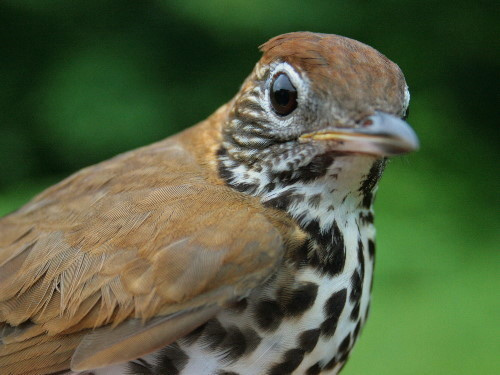 Louisiana Waterthrushes have been very scarce this spring, even more so than last year. 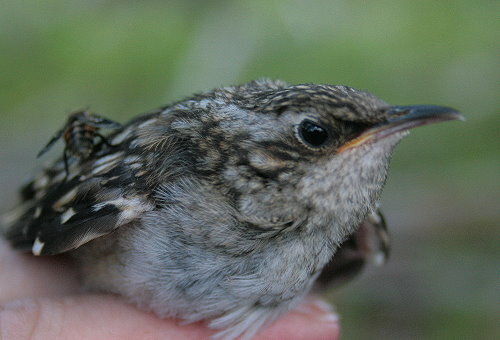 The species was recorded at seven sites in 2010, our first year, but only evident at two sites so far in 2012. 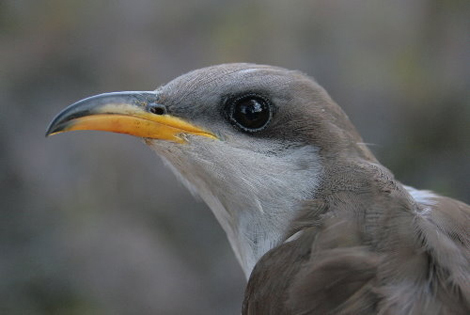 Fortunately, they are paired and probably nesting at the two sites. The steep sided stream corridors seem so empty without their voices. 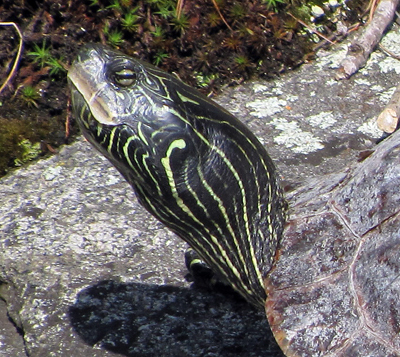 Many species are well into their nesting cycles. While observing the Barred Owl I tracked a female Black-throated Green Warbler, which had just finished bathing in the swamp. 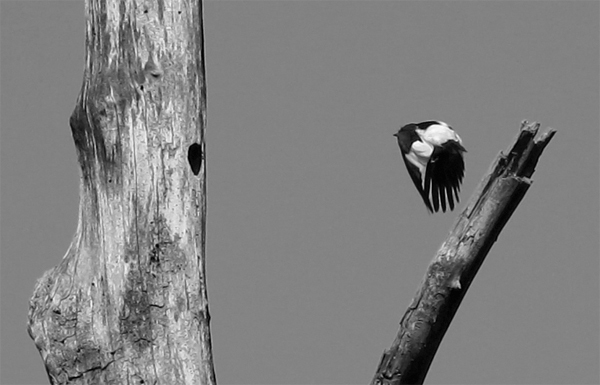 After a bit of preening and some flitting it plunked itself into a fork at the main trunk of a young Yellow Birch. 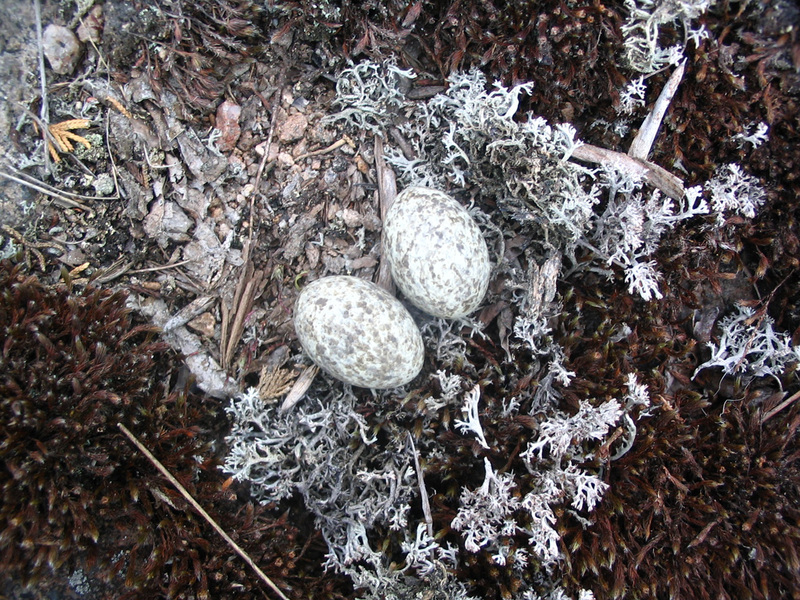 Raising binoculars to the spot revealed a surprisingly deep and bulky nest. 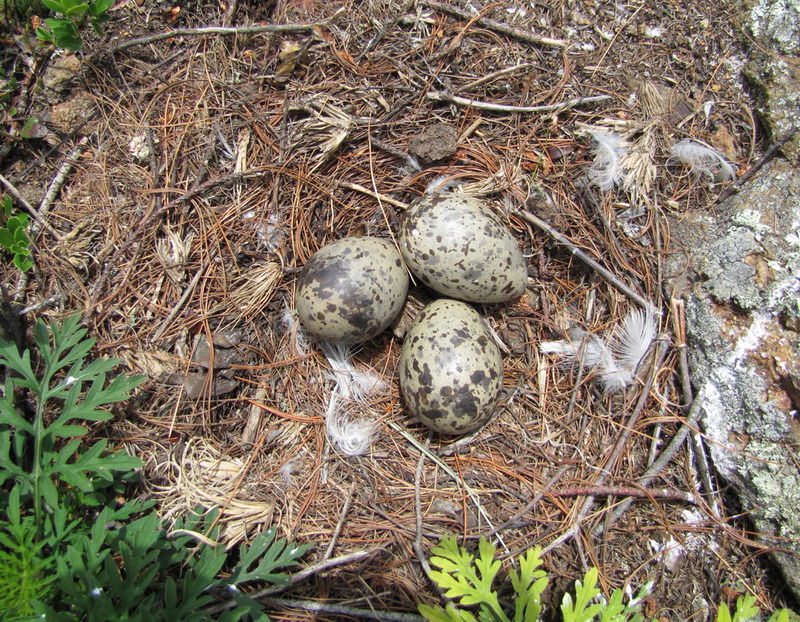 The earliest nest record for this species in Ontario is June 5 so a nest with eggs on May 24 is quite early. This particular record is also somewhat unusual in its location in a deciduous tree species within purely deciduous forest. 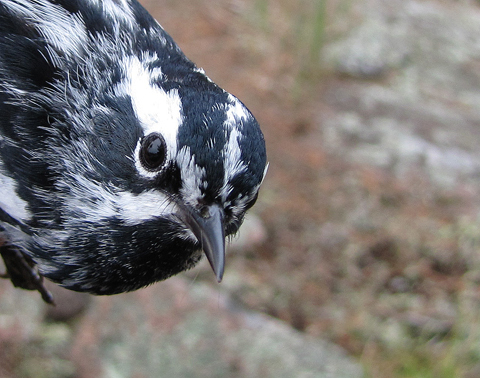 In Frontenac Provincial Park the Black-throated Green is more typically found in woodland with tall Eastern White Pine and/or Eastern Hemlock. However, a quick search of our point count data revealed that they are present, albeit in low numbers, within hardwood stands as well. 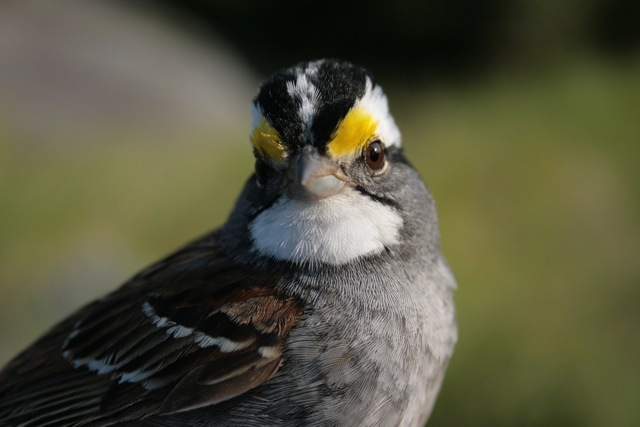 Below is a photo of habitat suitable for Golden-winged Warblers. 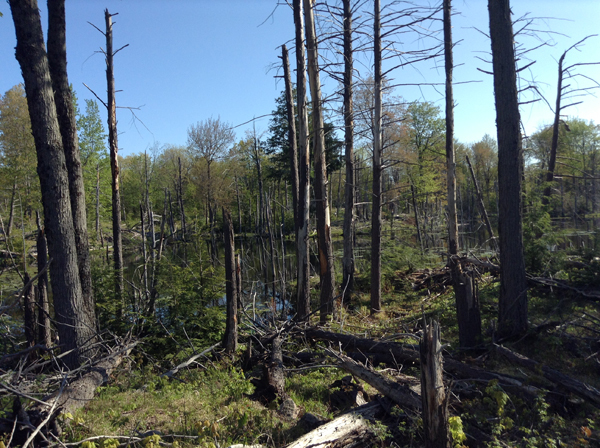 This was taken just southwest of Westport, ON where there are many small, family-run farms with low-intensity agricultural practices. 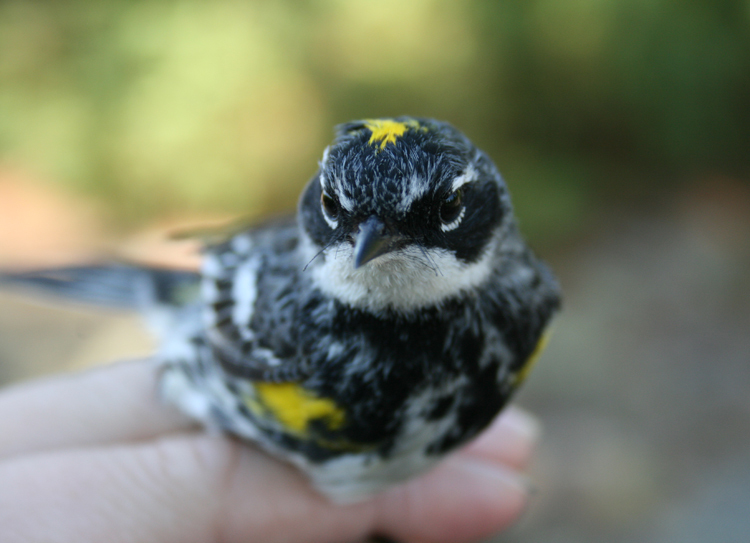 The presence of dense shrub cover at edges of property lines provides appropriate conditions for Golden-wings, which were designated as Threatened by COSEWIC in 2006. 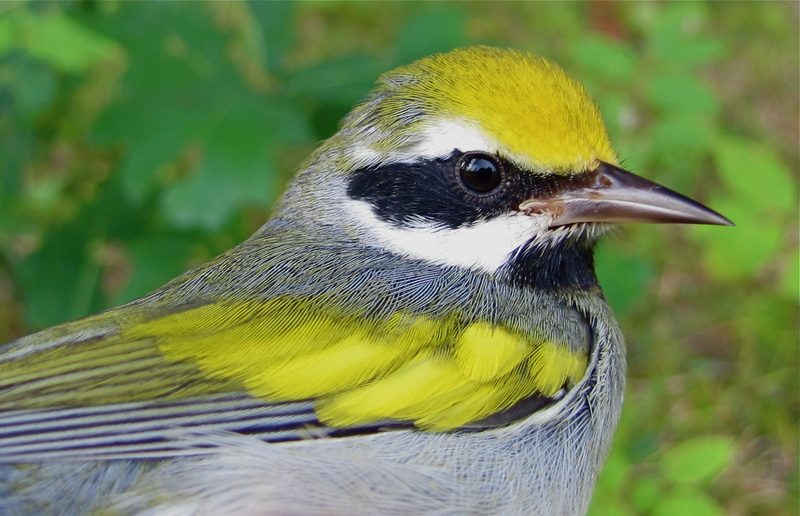 A total of six male Golden-winged Warblers were located yesterday morning with relatively little effort. 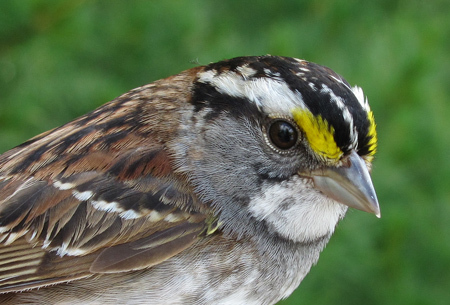 The Frontenac Arch and the southern shield ecotone are important regions for the protection of this species. In these areas, the rugged terrain and shallow till have been effective deterrents to large scale/intensive agriculture, so far…..
Land O’ Lakes indeed! 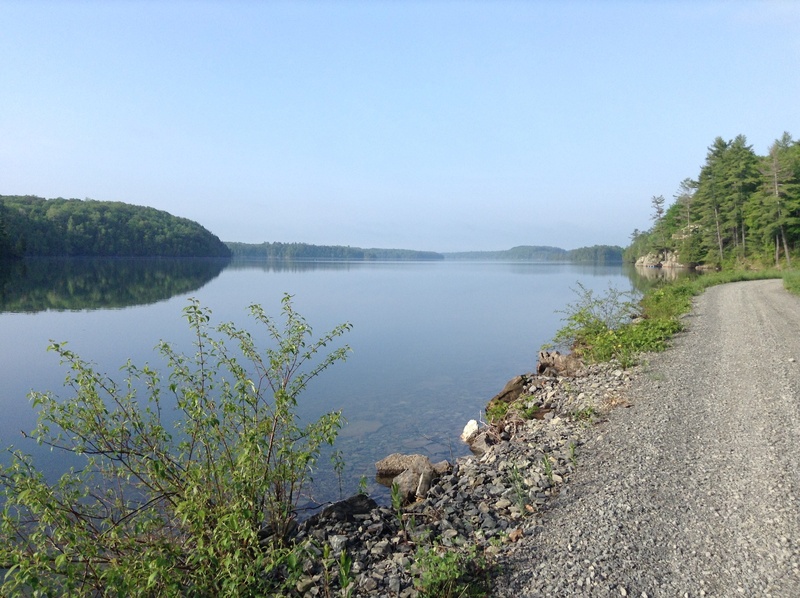 Frontenac Provincial Park lies at the southern tip of the great Canadian Shield with its astounding proliferation of lakes, wetlands and rivers. The map clipping above provides a glimpse of the difficult terrain here and also the number and distribution of lakes. The landscape is rich and beautiful but often very harsh too. The park has an impressive history – of miners, farmers and loggers who endured extreme hardship eking out a life here. The route I took this morning passes by abandoned homesteads and mines as well as the old log roll way at Hardwood Bay on Devil Lake. A century ago the land was mostly cleared and the air would have been filled with the sounds of men and women working the land. 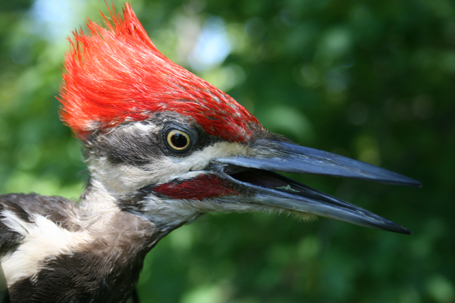 Decades of regeneration later, the area provides mature oaks, maples and hickories for troubled bird species, Cerulean Warblers and Red-headed Woodpeckers. 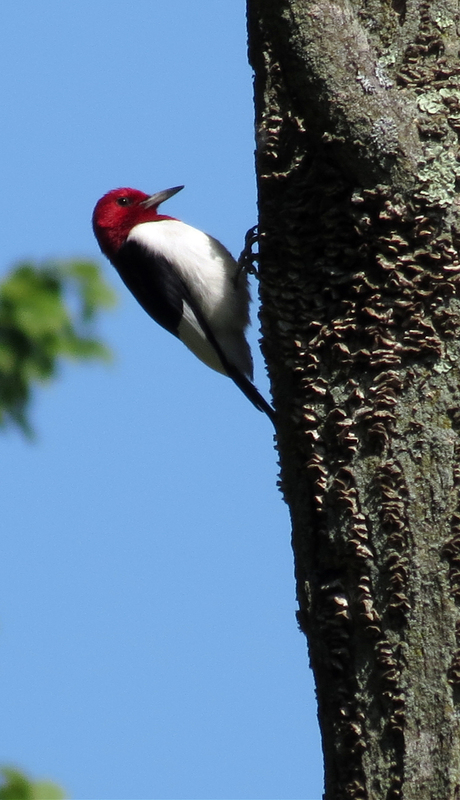 Very pleased to find that the Red-headed Woodpeckers have returned! 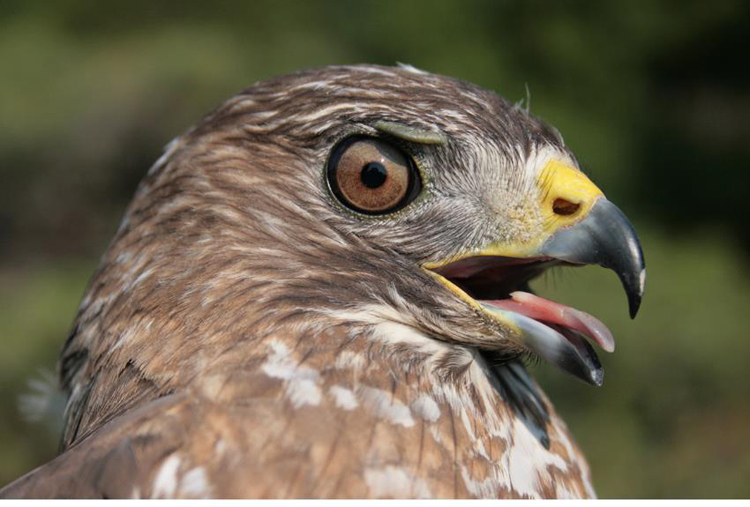 Hopefully this means that they were successful rearing young last summer. 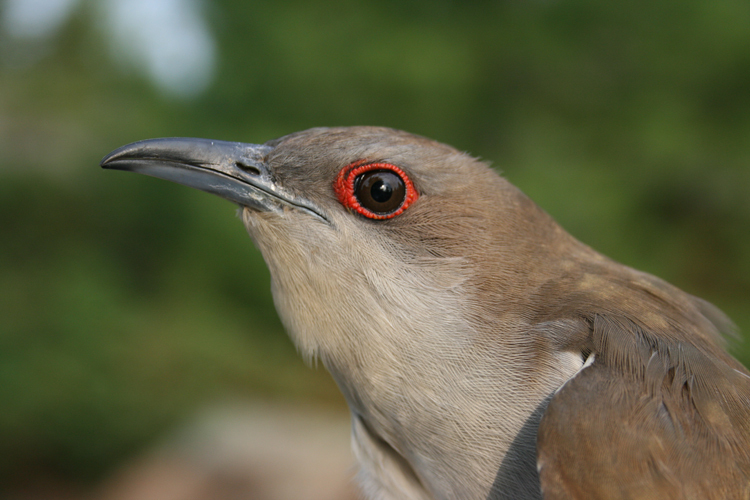 I watched the pair fending off Common Grackles from a nest site and also observed the pair copulate twice. I’ll make a point to return to locate the nest later on in the season and hopefully get some footage of the young being fed at the nest. I sought out this fantastic forest swamp for our ongoing project to inventory Louisiana Waterthrush habitat in the study area. This was a site that had not been visited before. I took the liberty of naming it Devil’s Swamp in my records. Northern Waterthrushes were present but no Louisianas today. This would be a high priority site for future monitoring, especially in years when the population is healthier in the region. 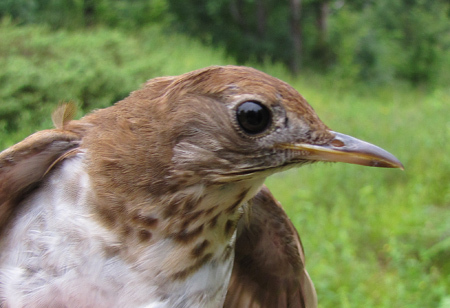 Once again, Louisiana Waterthrushes are present this year at only a few sites in the region but we are also finding a dearth of unmated “wanderers”. Great to be back in Frontenac this week! My first memorable observation of the season was of two black bears encountered along Devil Lake Road on an early morning commute – interesting start. This week I began revisiting stream and swamp woodland sites for Louisiana Waterthrush (Parkesia motacilla). 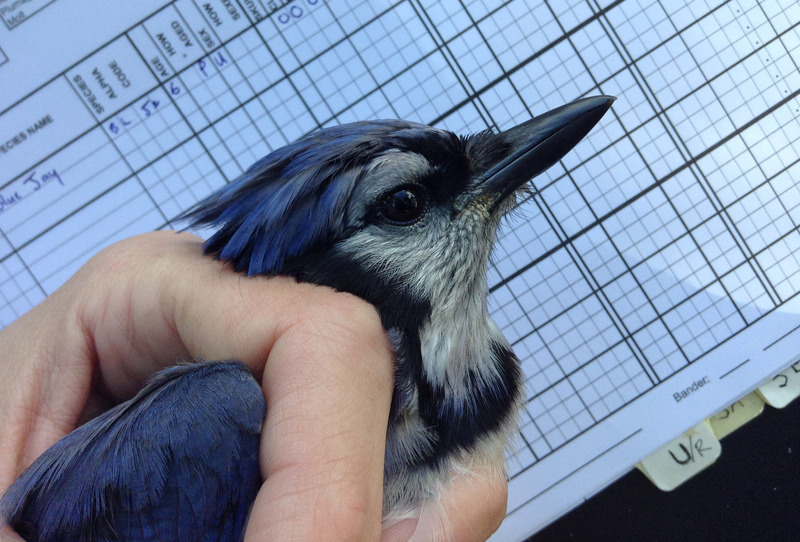 This will be our third and final season of inventory and monitoring for this species of concern. 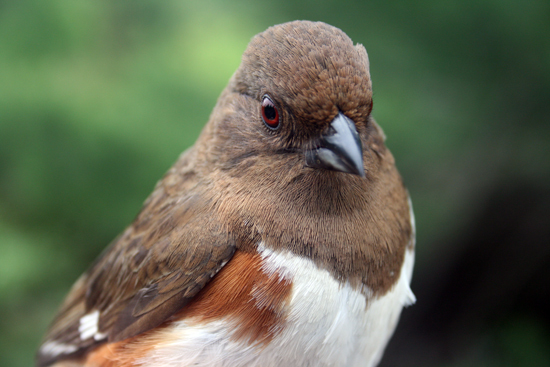 In spring 2010 and 2011 we emphasized the maximization of coverage for potentially viable breeding sites in the study area. 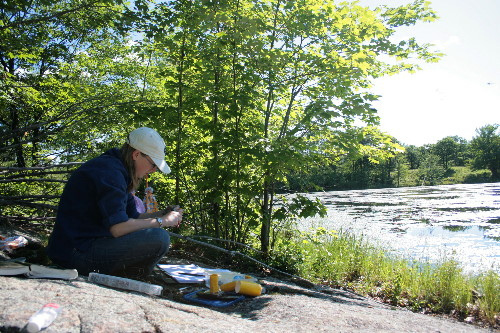 We have a handful of hitherto unexplored locations to check this year but most of our available time in May will be dedicated to historically occupied sites to procure assessments of breeding status in 2012. These West Virginia Whites (Pieris virginiensis) have been faithful companions on my travels to mature forested ravines and swamps in the region. 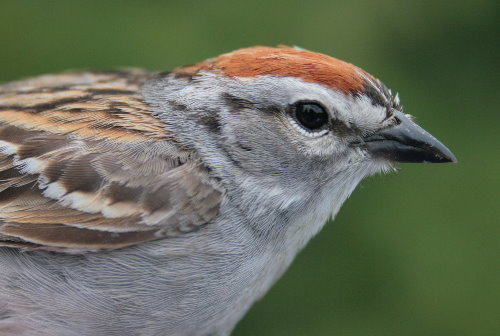 Once considered a Species at Risk, they remain quite rare, known to occur in only about 50 sites in Ontario. 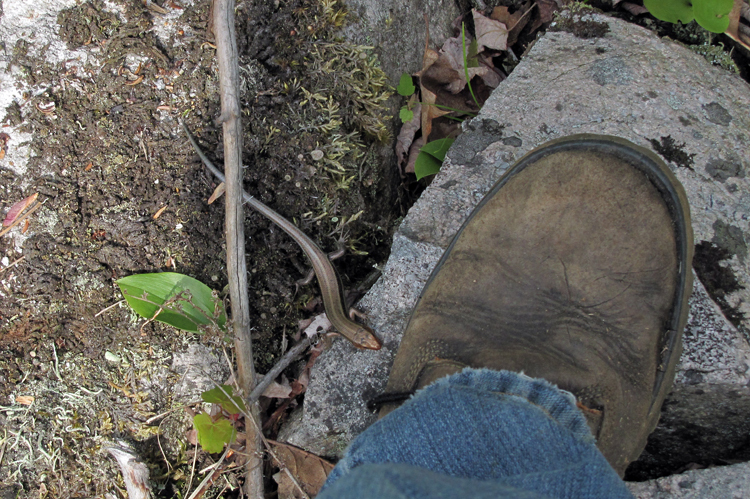 They are common in Frontenac Provincial Park on warm days in April and May. West Virginia Whites are threatened by habitat loss and the invasive Garlic Mustard (Alliaria petiolata), which is a close relative of their host plant, the Toothwart (Dentaria diphylla). Adults will lay their eggs on Garlic Mustard but the hatched larvae will not feed on the invasive plant and perish. 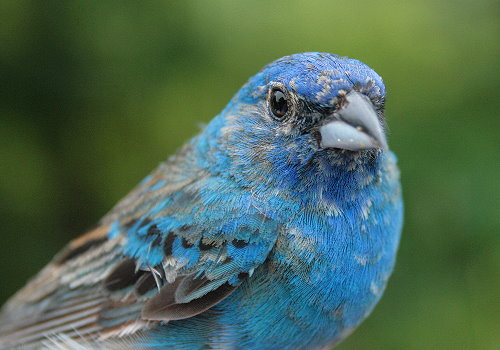 The birding was excellent this week thanks to the recent warm front. Cerulean Warblers were particularly numerous. 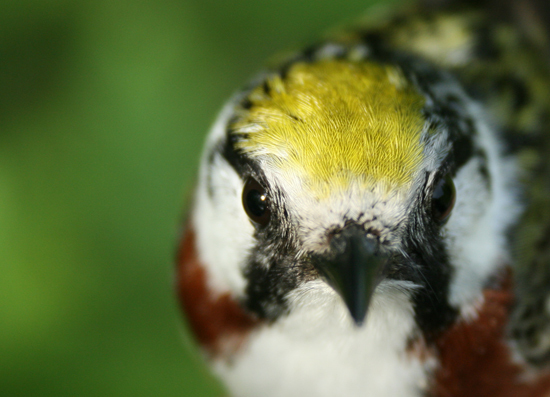 Eleven males were counted en route to one of our Louisiana Waterthrush sites. Over the years I’ve amassed an impressive collection of hopelessly blurry photos of Ceruleans or the perches they left behind. This is the best I’ve managed to come up with so far – sadly. 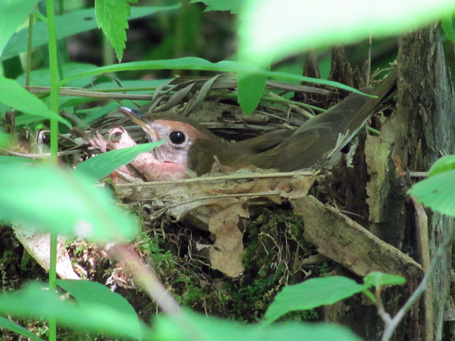 It was pleasing to find that Louisiana Waterthrushes have returned to the breeding site we first described in 2010! 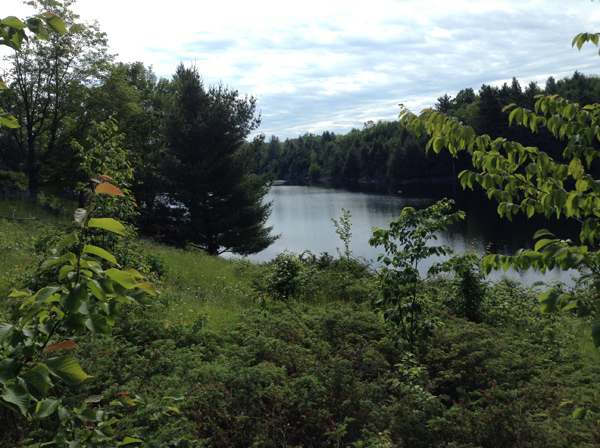 A pair has been detected here for three consecutive years, which makes this site in Frontenac Prov. Park one of just a few annual breeding locations in the region. High fidelity to these sites make them important “footholds” at the range limit where contraction and expansion can be marked. These Frontenac louies are true pioneers! 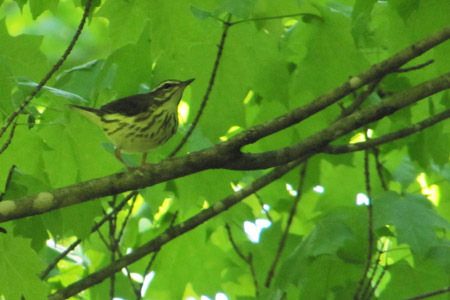 This video was recorded yesterday while revisiting the site where a Louisiana Waterthrush nest was found on May 26, 2010. The stream at this site is flowing with so much vigor that the two waterfalls severely limit the audibility of my playback system. Despite this I was able to locate a territorial male at the south end of the stream complex in a low valley sandwiched between two small ridges. 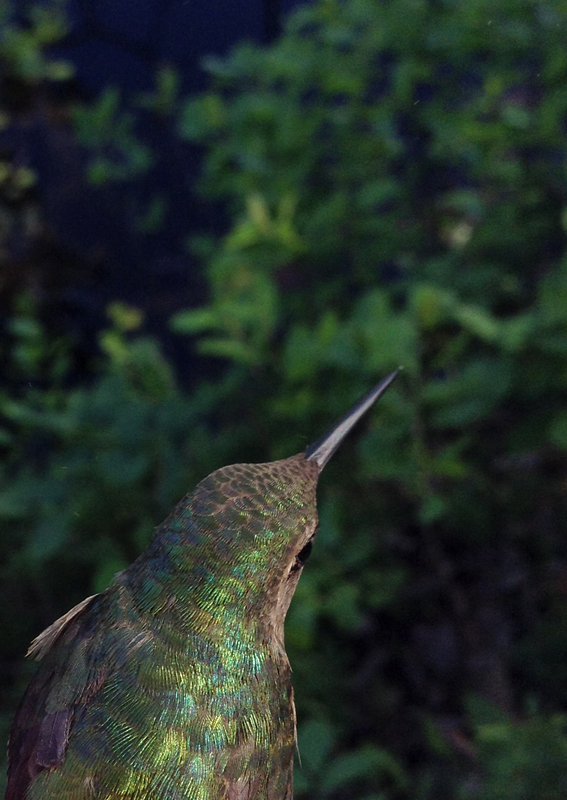 I promptly ended playback as soon as the male responded and watched him for about ten minutes or so as he moved back and forth from the stream to higher perches. 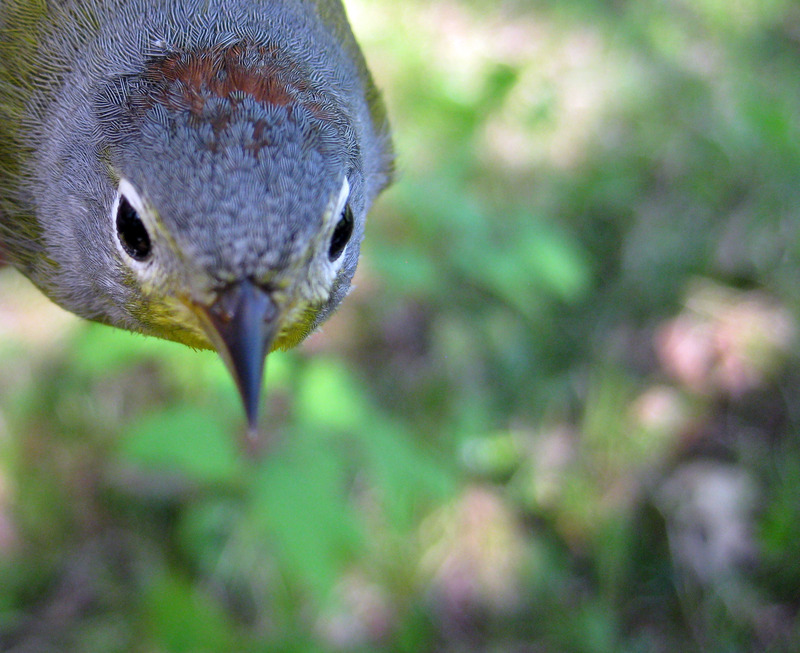 At one point he moved higher toward the canopy and was instantly chased off by a bill snapping small passerine, which turned out to be a female Cerulean Warbler (Dendroica cerulea). I followed the female for several minutes and hit an ornithological jackpot of sorts when she flew to a nest located on a horizontal branch of a large Sugar Maple (Acer saccharum), about 15m above the ground. 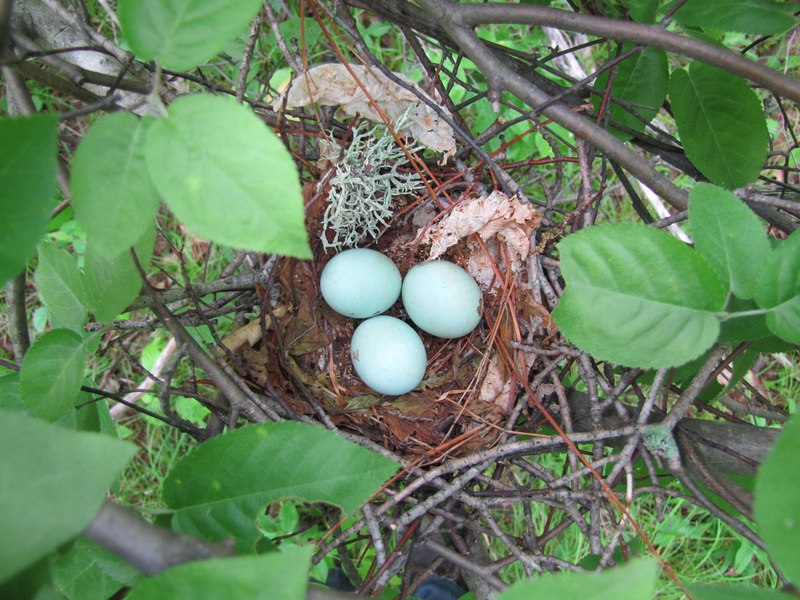 Cerulean Warblers build their nests high in the upper canopy of deciduous forests that have mature trees, little or no understorey and small gaps or breaks in canopy closure. 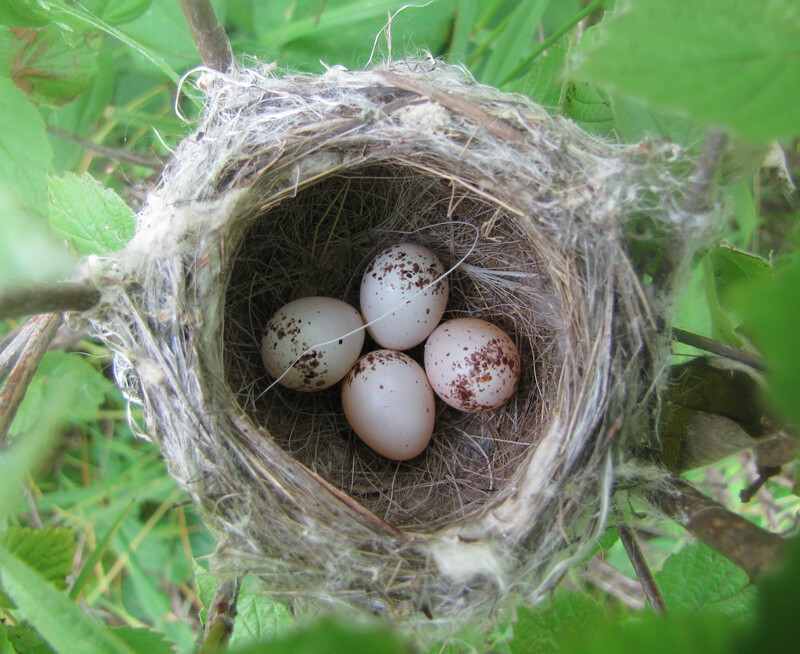 These characteristics make their nests quite difficult to find and even harder to inspect and monitor! In this case I was able to get a decent view of the nest from either of the two ridges, which put me roughly 15 feet closer to the crown of the large trees growing in the valley. Even with this advantage I still had to zoom to 39x to get a low quality recording. Gotta thank the 749 mosquitoes for all the shakiness. I will definitely be returning to this site (with a tripod!) to monitor both of these important breeders in the next several weeks. 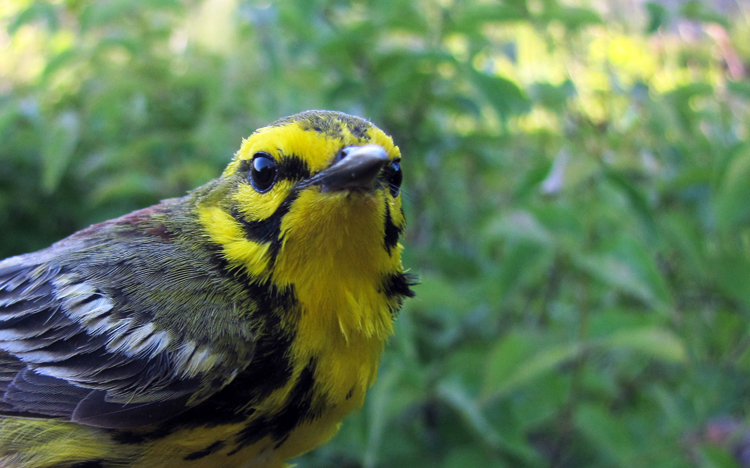 Frontenac Provincial Park is one of the most significant protected areas for Canada’s population of Cerulean Warblers now listed as an Endangered species by COSEWIC. Back to the waterthrush surveys. 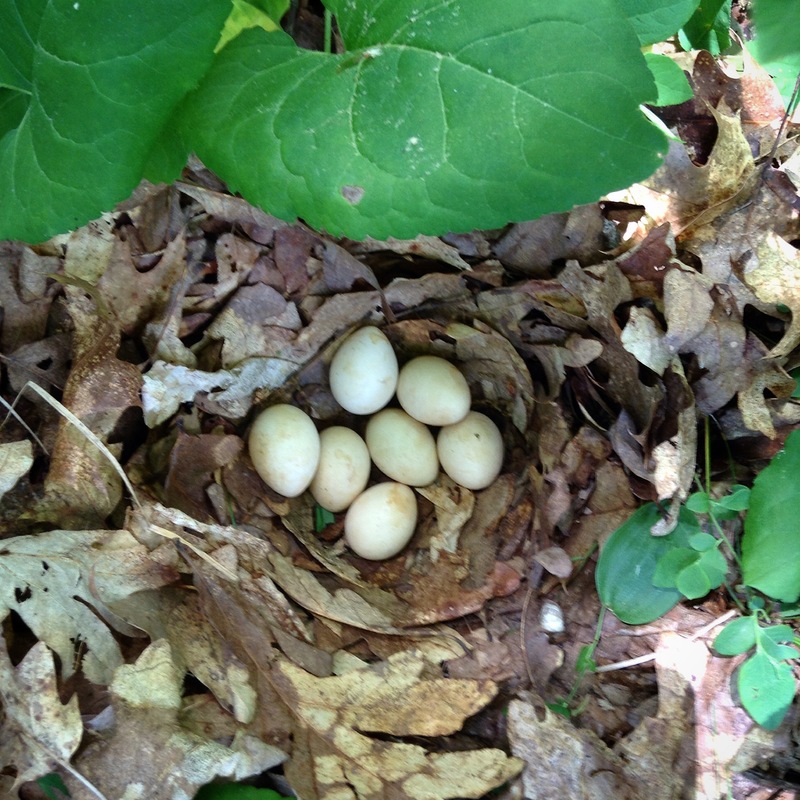 Things have picked up a bit since my last post but it seems that 2011 will be marked as a down year for breeding Louisiana Waterthrushes in this region. I have not been successful at several reliable sites despite as many as four repeat visits. A review of historical records show some evidence of a downward trend occurring since the first half of the last decade. Despite an apparent population decrease coinciding with the initiation of our study in 2010 it is critical to monitor the sites through the good times and the bad times. Interestingly, the high number of unoccupied sites found this year has only buoyed my interest in the study going forward. Also, the 2011 season is not over yet as surveys at five more sites are yet to be completed and I do have four active sites to keep tabs on.